American woody plant expert Michael Dirr mentions that black walnut trees are seldom planted in the garden landscape, but if one does exist, it is worth preserving. This large deciduous tree native to the eastern United States provides both cooling summer shade and a crop of edible walnuts each autumn. 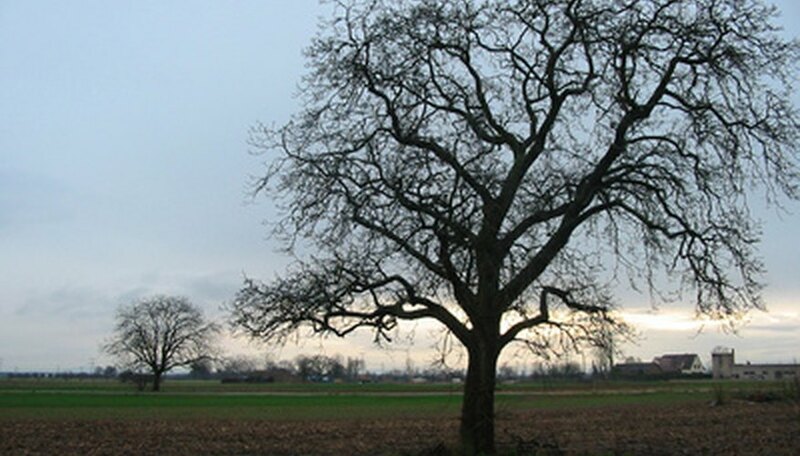 Growing its largest on deep, moist, well-draining soils rich in silt and nutrients, a black walnut tree can reach 50 to 75 feet tall and about 50 feet wide. It grows in U.S. Department of Agriculture winter hardiness zones 4 through 8. When a seedling, the black walnut grows quickly and establishes an extensive root system. Mature black walnut trees develop with an upright, open-branching but oval/rounded canopy supported by a singular trunk. Old specimens become massive in scale. Even though black walnut is not extremely fast-growing, the U.S. Forest Service states that it does grow faster than other trees that often grow in its vicinity, including oaks and basswoods. Black walnut foliage is coarsely feather-like in texture on the tree, as each leaf is compound, comprising many pointed leaflets. The leaf is 1 to 2 feet in length and is attached to the branch in an alternating pattern. The leaf comprises 13 to 23 leaflets, each leaflet about 3 to 5 inches in length with serrated edges. They are dark green in color, and if crushed, they emit a stinky fragrance. During periods of summer drought, leaves prematurely yellow and drop from the tree. In early to mid-autumn, the black walnut already is naturally dropping its foliage, well in time for winter. The flowers of the black walnut are not showy compared with those of other ornamental trees, but they are still noteworthy. Male and female flowers occur on the same branch, but with different forms. Male flowers look like small scaly cones called catkins, whereas the female flowers are tiny and held in large drooping clusters that look like green millet seed sprays. Blooming occurs in mid-spring just after the first new leaves are unfurling. The wind facilitates flower pollination. The fruits form from fertilized female flowers and botanically are true nuts. Each nut has a leathery green covering, matures 1 1/2 to 2 inches in diameter and ages to become brownish to black in color. If you rub an immature fruit's surface, the oils oxidize on your skin and stain it dark brown. Eventually, the semi-fleshy husk of the fruit breaks open to reveal the seed (the kernel), which is sweet-tasting, mealy and oily. The fruits readily drop like hailstones from the tree anytime from late summer into fall. In the dead of winter when both foliage and fruits are absent or buried under snow, the black walnut tree still can be identified. The tree's trunk bark is dark brown to grayish black in color and corky. It is deeply furrowed and creates a narrow run of chevron or diamond-like patterns. Each branch twig has a terminal bud that is fuzzy. Breaking a stout but brittle twig reveals a cream-colored, chambered pith. Chewing on the twig creates a bitter taste in your mouth. Also look for leaf scars on branches that are in an alternating pattern. What Is a Linden GreenspireTree?